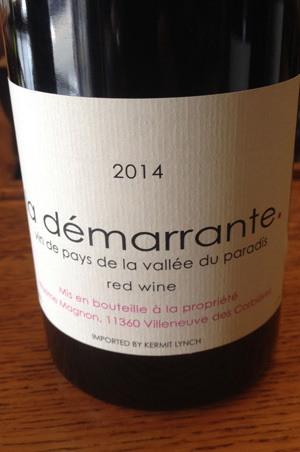 2014 Maxime Magnon, La Demarrante, Vin de Pays de la Vallee du Paradis, France. Whatever your feelings on “natural” wine or biodynamics, this wine and Maxime Magnon might move the needle, his wines show a pure clarity that defines the place and cepage into a single life force, you can not help but be impressed and admire the pleasure in these wines, especially the La Demarrante 2014 made from old vine Carignan and Cinsault. The La Demarrante is labeled as a Vin de Pay, because Corbieres doesn’t allow for this particular combination of varietals to be classified, but for understanding proposes it must be said that is what this beautiful red wine is in it’s soul and character, made with native yeasts and almost no sulphur, with whole cluster/semi carbonic fermentation(s) and the La Demarrante is aged in neutral cask and cuve/vat. The soils here are Schist and iron rich with some limestone, there is almost no top soil and it is dramatic rocky terroir and in Magnon’s case a place of small yields and expressive fruit, he trained with Jean Follard in Morgon and you can see that style coming through, in recent vintages there’s no question that Maxime is on a roll, these wines are remarkable and wonderfully focused with energy and verve. The young La Demarrante is gorgeous right out of the bottle with flamboyant fruit, floral and savory spices jumping from the glass with charm and fresh intensity showing blackberry, huckleberry, red pepper flakes, chalky minerals, crushed violets and bright cinnamon with a certain plummy feel and lingering anise and briar tangy sensations along with a hint of leather, cherry and blueberry compote finishing with dusty currant and sticky lavender. Drink this one greedily and as often as you can, one of the most interesting Carignan offerings I’ve tried this year and lovely stuff, best from 2016 to 2020.